I've really missed seeing Joo Won on the big screen. He's one of those rare actors that I find talented, likeable, as well as impossibly adorable. Interestingly, since the last show I watched him in was Good Doctor, it feels like a carryover to see him once again as a surgical genius, executing those unnecessarily graphic (and probably medically inaccurate) surgeries on the screen again. He's the essence of this show, which I, as well as what seems to be the whole drama watching community, am completely loving at the moment. 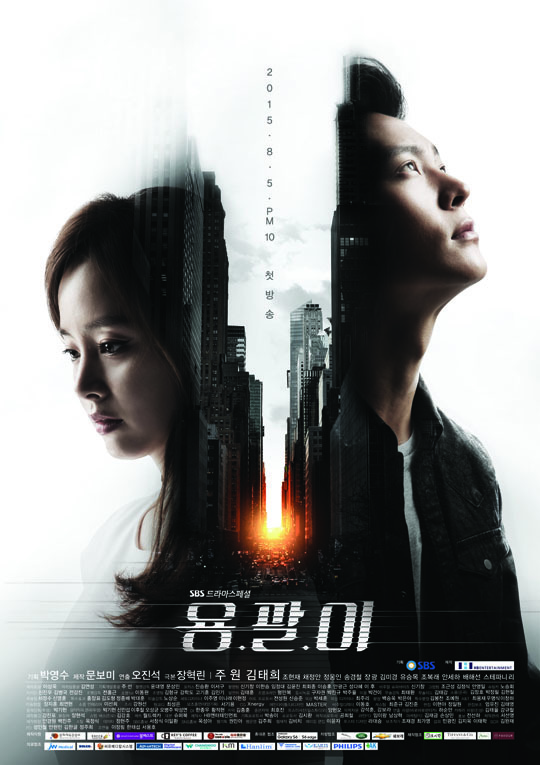 I think the heart of Yong Pal's appeal is its combination of multiple fascinating premises, which are cohesively linked together and executed upon with solid directing and strong acting. Vigilante doctor is certainly a fun and novel concept, made even more intriguing when combined with a forced sleeping beauty. It's got that bit of edge, along with the expected action and romance. I also quite like Kim Tae Hee, who while historically not a great actress, has always had plenty of charisma and charm (and of course always looks stunning). While her role is clearly secondary and has so far featured far less screentime, I'm pleased with the performance she's making. Here she manages to just own Yeo Jin as a character, making her feel both brittle and strong. The chemistry between her and Joo Won is also pretty solid considering the age difference. So I've said this about many dramas before, but here again I'm not impressed with how rapidly and almost out of the blue the romance emerged. Our leads early interactions were like slightly condescending acquaintances, which fit the patient-doctor dynamics. We see a nice friendship emerge, but then almost overnight that transformed into a soul-sweeping love. I get it, sometimes feelings emerge quickly, but I think it was a little rushed in this case. It doesn't diminish my love for the two characters and my support of them together, but I would have liked some more character interaction and development in between. I wonder if Chae Jung Ahn ever gets sick of playing the second-lead with the constantly unrequited crushes on the main guys? I actually find her very likeable and reasonably talented, but honestly her roles are getting stale. Also, what's with her and the slinky yoga / workout scenes in just about every drama (Yong Pal's was a near copy of the When a Man Loves scenes)? I'm starting to think all the directors are a bit perverted with regards to her. She is a gorgeous lady, and one of those perennial second leads that I feel bad for getting sidelined all the time. I do enjoy her character here though, who's written with more complexity than our actual leading lady. She's so likable, and a big part of me wants her to find happiness, even if that means accepting her crazed husband. The same could be said for Jung Woong In, who I really want to see outside of the villain roles. Does no one else remember him as the haphazard second-lead from Coffee House? He is so, so much better at comedic, human roles than constantly playing a stick figure villain. IHYV was both a boon and a curse for him, in that it finally got his name out, but left him completely typecast as a dramaland villain. You can't see him and not expect him to eventually become the drama big bad. I will consent that at least his role here is a tiny bit more dimensional and interesting than his laughably evil Empress Ki part. There seems to be some attempt to make him vulnerable and in possession of a conscience here, but I'd like to see that taken further, if only to give this poor actor a chance to act out something other than evil glares. I am so far happy with Jo Hyun Jae's character. The trend of big names taking on villainous second-lead roles, much like Yun Jung Hoon did in Mask, is something that I'm generally appreciating. Yes, it probably is a shame these actors aren't in the leading role when they totally have the capability to be, but at least they make the villains come to life far more than a less talented unknown. And I'd like to think they also inspire the writers to generate stronger characters with more nuances and motivatons to act out. Say Han Do Joon here, who I pity far more than I hate. He's done terrible things, but then you see his one-sided love for Chae Young (which I'm still working to figure out) and you can't help but feel sorry for the guy. It makes me really want Chae Young to give him a chance, just to see if that will fix the issue or if it's something deeper than mere lack of affection. The thing that worries me is that this show is slated for 24 episodes, and at less than halfway it feels like most of the threads I care about have already been resolved (e.g., getting Yeo Jin out and developing her love for Tae Hyun). Most dramas are capable of sustaining a strong first half, but we all know it's the second half that's a true test of ability. I'm more wary than hopeful, but at least for now I'm still interested and will watch to see what the story brings.